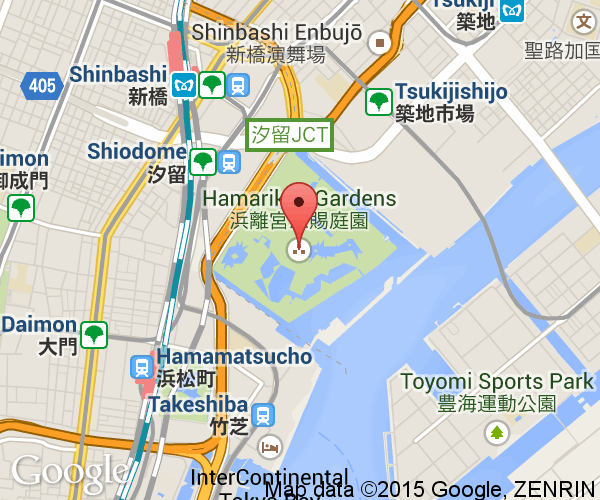 Hama-rikyu Gardens (Hamarikyu Onshi Teien) are Tokyo's largest and most famous Japanese gardens. It is also one of two surviving feudal era landscape gardens in Tokyo today and one of only a small number of saltwater Japanese gardens in the world. The garden is actually an island as it is surrounded by the Tsukiji River, Shiodome River and the ocean on all four sides. The only way in is by bridge or water bus. 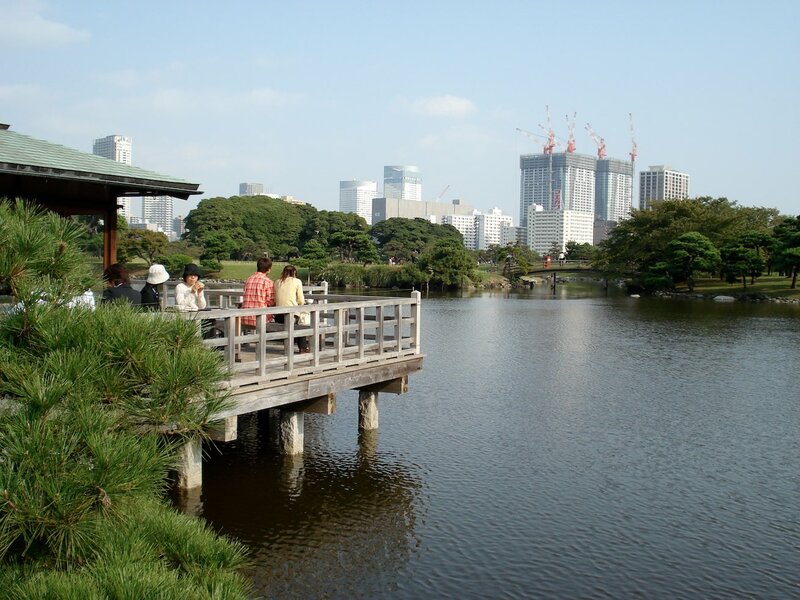 The Kyu-Shiba-rikyu Gardens further south is the only other garden from this era left in Tokyo. 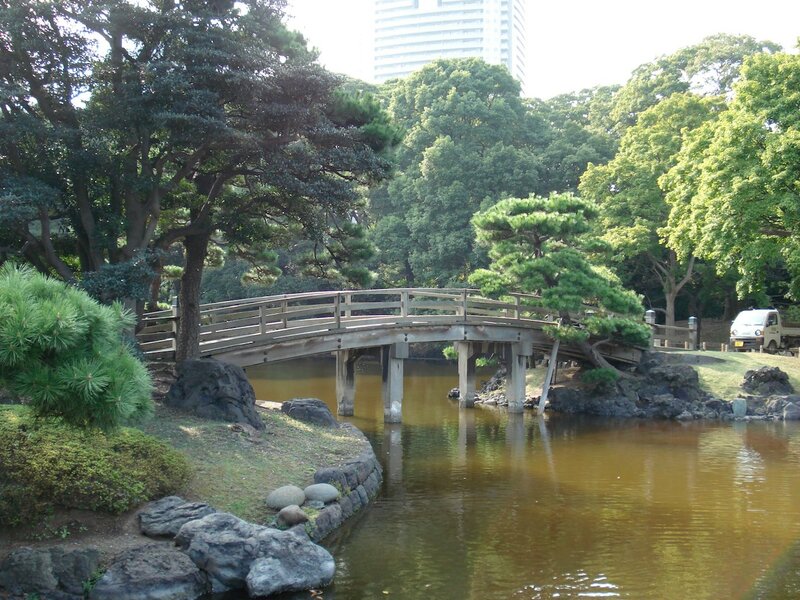 Hama-rikyu Gardens contains a very elegant and classic Japanese garden in its southern portion that will take at least an hour to wander through. The northern portion was developed after the Meiji period and clearly show the western influences. It is a fairly humble garden and forgoes many of the kitschy aspects of other Japanese gardens like ornamental lanterns every ten feet. Simplicity has its charms and it is quite relaxing to amble through its grassy rolling hills and cross the many bridges over the water. It is not a circuit style garden so there's really no defined path to follow. One of its best features is that it is a saltwater garden. Instead of carp, you literally get whatever that was sucked in. The lock system in the northwest corner ingeniously works to maintain a constant water level, but can also act to pull fish into the gardens. Despite its location in the middle of Tokyo, remarkably little of the original land has been poached by developers. 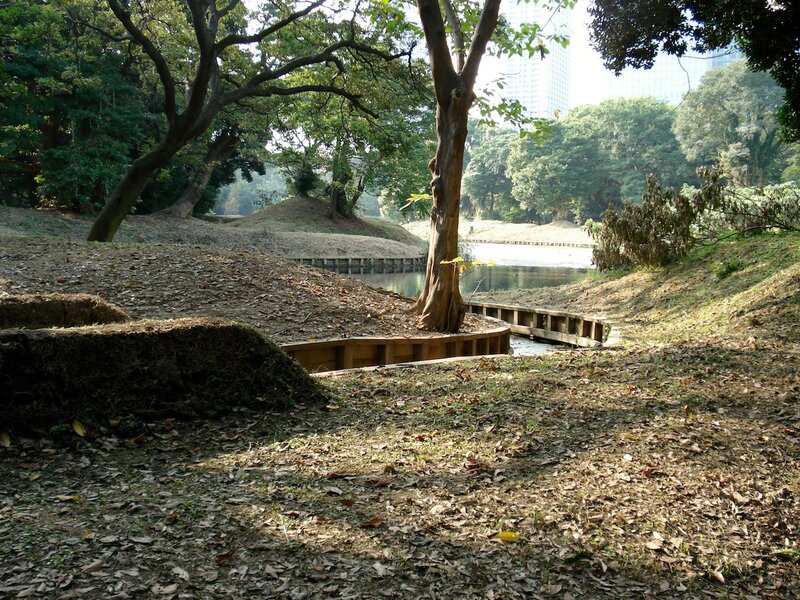 A large portion of the gardens is actually used up for two birding ponds (Kamoba) for gentry. You know, the kind where 50 of your paid friends scare birds down an intricate trap and net them for you. The northern portion has a plum orchid, cosmos and canola flower garden and a peony garden. The northwest enterance is also where you can find the garden's three hundred year old pine tree. The modern skyscrapers crowding in on Hama-rikyu gardens are either scenery or a disagreeable eyesore depending on your tastes. Thankfully, It suffers far less noise and visual pollution than Kyu-Shiba-rikyu Gardens which is the other surviving garden from this era. 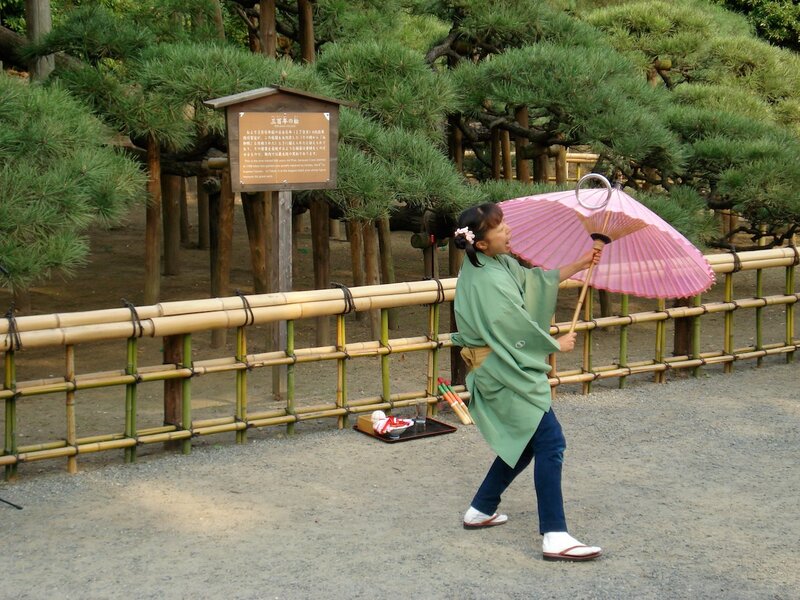 The additional parts like the birding pond give visitors more accurate sense of the recreation enjoyed by the samurai class. It is well worth a visit and, honestly, just walking down the seawall and looking out at Tokyo Bay is worth the admission price. The water bus stops in the north east corner of the park. 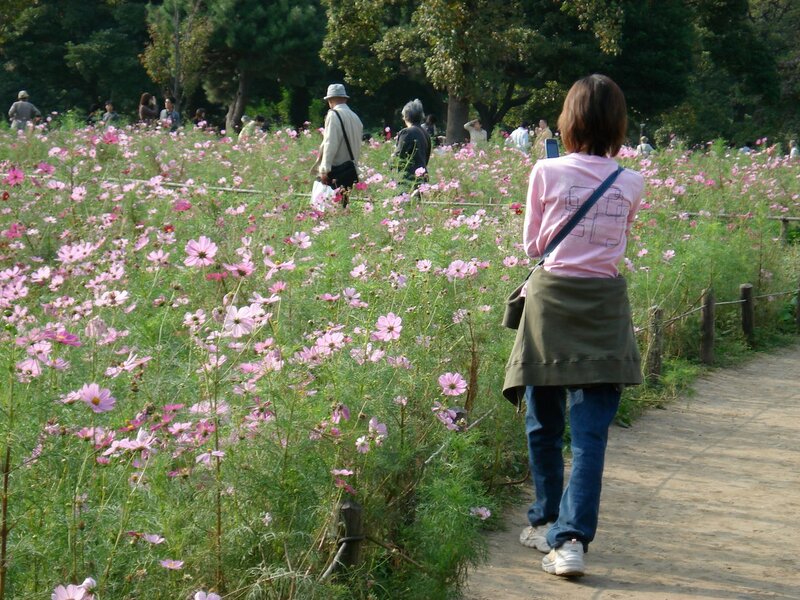 If you enter this way, you must also pay for admission to Hama-rikyu Gardens as well as the bus fare. The water bus goes north from here to Asakusa and south from here to Odaiba. 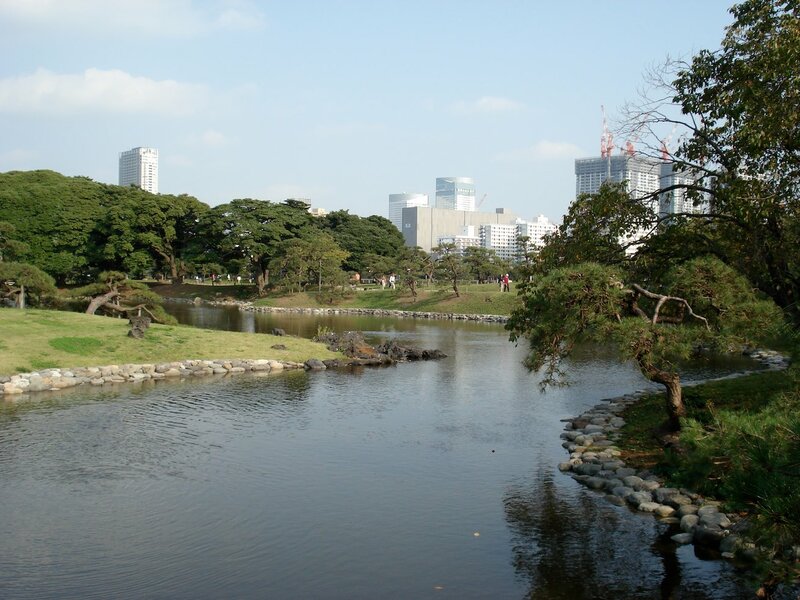 The Hama-rikyu Gardens are a 10 minute walk from JR Shimbashi Station and located nearby the skyscrapers of Shiodome. The station itself is just two stops south of Tokyo Station and is located on the Yamanote Line and the Keihin Touhoku Line. Yamanote Line trains circle central Tokyo and have light green markings.